A researcher and her team to journey in search of a worthy goal: better care for patients with lymphoma. When she began practicing medicine, Lisa Rimsza, M.D., a Mayo Clinic hematopathologist, faced a frustration common in the cancer field. After diagnosing patients with an immune system cancer called lymphoma, she couldn’t provide the information they most wanted to know: What’s my prognosis? What’s the most effective treatment for me? “Sometimes, the lymphoma could be controlled with chemotherapy, but other patients relapsed repeatedly. Why? We just didn’t have many answers,” she says. At the same time, the researcher within her was fascinated. Lymphoma is the most common immune cancer. It affects a type of white blood cells known as lymphocytes that travel through the blood repelling invaders such as viruses and bacteria. Lymphoma develops when a change or mutation occurs in a lymphocyte, causing the abnormal cell to replicate faster or live longer than normal. 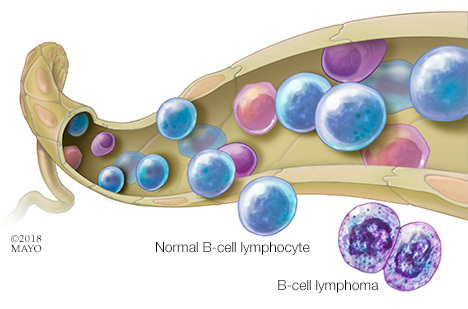 Lymphoma develops when mutations occur in white blood cells called lymphocytes whose job is to travel through the blood and fight off invaders. The broad classification of non-Hodgkin lymphoma accounts for about 4 percent of all cancers in the U.S. Roughly 662,000 Americans have non-Hodgkin lymphoma, and about 20,000 Americans die from the disease each year. Among non-Hodgkin lymphomas, the most common is diffuse large B-cell lymphoma, which represents about 30 percent of all lymphomas in the U.S.
Compassion and curiosity have guided Dr. Rimsza’s work for the past 20 years. Founder of the Mayo Clinic Molecular Diagnostic Arizona Laboratory, she is transforming lymphoma care through her research. “Dr. 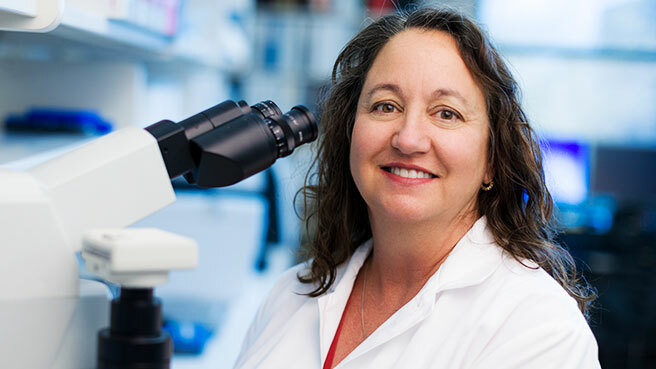 Rimsza is among a rare breed of individuals who are gifted clinicians and also successful scientific investigators,” says Elaine Jaffe, M.D., who leads lymphoma research at the National Cancer Institute. The Mayo Research Committee apparently agrees, as it has designated her as a clinician-investigator, a small subset of physicians who officially split their time between patients and the laboratory. Lymphoma is challenging because there are hundreds of types and subtypes with subtle differences at the cellular level — differences that affect an individual’s prognosis and response to treatment. Much of Dr. Rimsza’s work involves identifying these variations in lymphoma cells. She holds 14 patents for methods to establish lymphoma cell variations and predict patient survival associated with them. One of Dr. Rimsza’s patents led to the invention of a genomic test that guides diagnosis and treatment of diffuse large B-cell lymphoma, a common type of the disease. 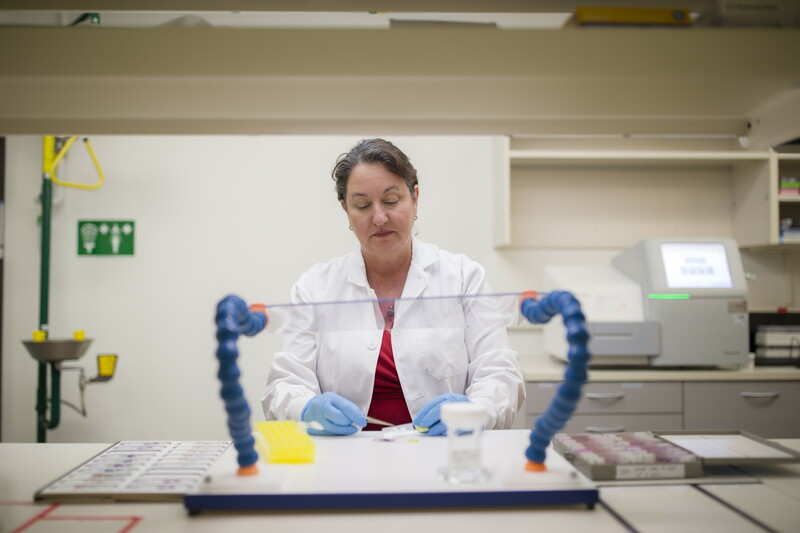 The Arizona molecular diagnosis lab was the first in the world to offer the test, known as Lymph2Cx. 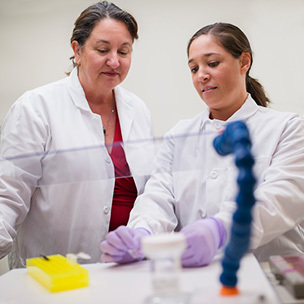 Dr. Rimsza, left, and Colleen Ramsower, senior research technologist in the lab. Since early 2017, Lymph2Cx has provided important information about lymphoma cells in about 100 Mayo Clinic patients. The test uses a 20-gene expression-based assay to establish where a patient’s lymphoma started. That “cell-of-origin” information helps determine the patient’s prognosis and the optimal therapy for that individual. The test already is paving the way for improved treatment. Grzegorz Nowakowski, M.D., a specialist in blood cancers at Mayo Clinic’s Rochester campus, is leading a clinical trial of a new chemotherapy regimen for an especially aggressive cell-of-origin subtype of diffuse large B-cell lymphoma. Results of that clinical trial are expected in late 2018. In addition, Dr. Rimsza has a developed a technology involving genomic testing of another B-cell lymphoma, known as mantle cell lymphoma. This lymphoma type is the result of abnormal changes in immune system B cells in the outer edge or “mantle zone” of a lymph node follicle. Mantle cell lymphoma is a conundrum, as it’s often aggressive but sometimes progresses slowly. “The problem is that there’s no way to know at the time of diagnosis what kind of MCL we’re dealing with. We don’t know if a patient needs immediate therapy and a bone marrow transplant, or just needs to be monitored every couple of months,” Dr. Rimsza says. As a result, treatment decisions are usually based on a patient’s age, with aggressive therapy used only for people under the age of 60 or 65. The lack of specific age cutoff reflects the fact that there’s no standard therapy for mantle cell lymphoma. Dr. Rimsza has discovered a powerful mantle cell lymphoma biomarker, a uniquely characteristic pattern of genes associated with cell proliferation and cancer growth. With a grant from the National Institutes of Health, she is now developing a laboratory test, based on the patent-pending technology, that ultimately could provide treatment guidelines for mantle cell lymphoma. 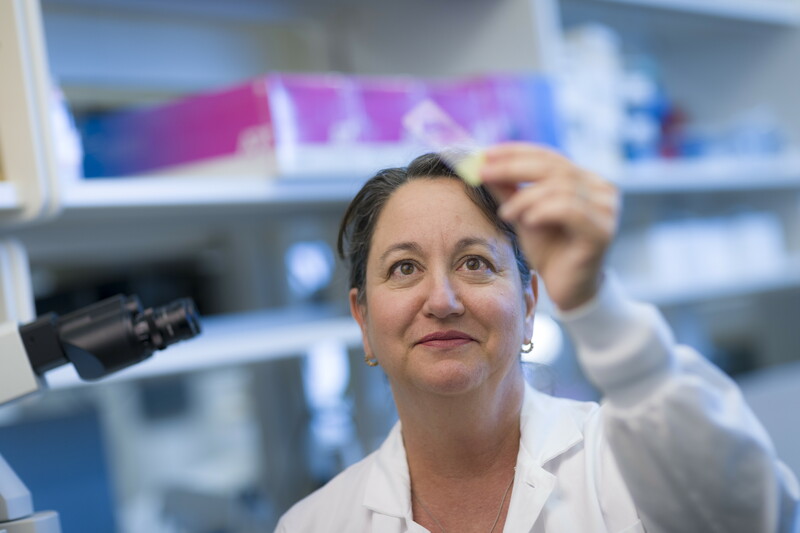 “I love the idea of harnessing the power of the immune system to eradicate cancer — turning that immune machine back on, so the body itself takes action rather than having to rely on chemotherapy drugs,” she says. For Dr. Rimsza, science has always been a team effort. “She wants to get other people engaged, and her enthusiasm is infectious,” says Henry Tazelaar, M.D., chair of Laboratory Medicine and Pathology at Mayo Clinic’s Arizona campus. Her lab team is part of the Lymphoma/Leukemia Molecular Profiling Project, an international endeavor to learn more about the genomics of blood cancers, which works closely with the National Cancer Institute. Among other team projects, Dr. Rimsza is program director and principal investigator for the AIDS Specimen Resource, a project funded by National Cancer Institute to investigate the genetic profiles of diffuse large B-cell lymphoma in HIV-positive patients. In addition, with colleagues from Mayo Clinic’s Rochester campus and funding from a National Cancer Institute Specialized Programs of Research Excellence grant, Dr. Rimsza is investigating prognostic signatures for follicular lymphoma. She also leads an international team of researchers studying “orphan” lymphomas — rare and highly aggressive disease subtypes. Participating institutions include the National Cancer Institute, University of Oslo in Norway and the University of Würzburg in Germany. “We want to find features that are key to getting a correct diagnosis and prognosis, and hopefully a ‘druggable’ biomarker,” she says. Dr. Rimsza is also realistic about progress.